The quality of life we enjoy in our state is directly connected to the public systems and structures we have created over many decades. Our state budget represents our collective investment in the public institutions and services that educate our children, keep our communities safe, and provide health care and other services to our neighbors who need it. However, the previous unwillingness of the legislature to seriously consider additional revenue to adequately balance the budget has resulted in deep cuts to services essential for low-income families, children, seniors, and people with disabilities. The base budget is the resources necessary to cover current biennium expenses of an ongoing and non-extraordinary nature. In recent budget cycles, the base budget is built by looking at what was appropriated on an ongoing nature in the second fiscal year of the previous biennium. The base budget for this upcoming 2021 biennium budget cycle will be ongoing appropriations for fiscal year 2019. Present law (PL) is the amount of funding needed to maintain operations and services at the level set by the last legislature. Present law includes but is not limited to legally mandated workload, caseload, or enrollment changes, changes in funding requirements, inflationary or deflationary adjustments, and elimination of one-time-only appropriations. New proposals (NP) are requests to provide new non-mandated services, to continue programs previously funded one-time-only or sunsetting, to change program services, to eliminate existing services, or to change the sources of funding. The biennium budget process starts off with the governor’s proposed 2021 biennium budget. Governor Bullock released his proposed budget on November 15, 2018, which proposes to restore some of the reductions made in 2017 and build back a healthy ending fund balance (see Appendix A). However, some programs and services are still below where they were at the start of 2017. As the legislature comes back into session in January of 2019, policymakers should find ways to restore lost investments and put Montana back on a path of shared prosperity. This report provides an overview of the executive’s proposed 2021 budget. With revenue levels below projections in 2016 and 2017, the legislature made deep cuts in 2017 which left most state agencies starting the 2019 budget process below where their budget two years ago (see Appendix B). While state agency budget reductions varied widely, most agencies faced a 5 to 10 percent reduction from 2017 to 2019. While the Department of Public Health and Human Services (DPHHS) starts this budget cycle slightly above its previous base from 2017, many individual divisions within DPHHS faced deep cuts in 2017 and start with a 2019 base well below the previous biennium (see Appendix C). For example, Developmental Services, Senior and Long-Term Care, and Addicted and Mental Disorder divisions start the 2019 session with base budgets 4 to 6 percent below 2017 base. General Fund (GF) is money available for the state to use for most of its function without restrictions. State special revenue (SSR) funds are kept separate from the general fund and are legally restricted for specific uses. Federal special revenue (FSR) funds (or federal funds) are funds from the federal government that are made available to the state to fulfill specific purposes. Often federal funds require a certain level of matching state funds. Ending fund balance exists when the amount of anticipated general fund revenue exceeds general fund appropriations. An ending fund balance can be used to maintain fiscal stability over a biennium when revenues collected are not as high as anticipated. Governor Bullock’s proposed 2021 biennium budget proposes primarily only present law adjustments, or what resources will be needed to continue existing level of services. Most of these present law budgets result in an increase in 2021 biennium budgets compared to FY2019. It is worth noting that a handful of divisions within DPHHS are facing a negative present law adjustment, most notably within the Developmental Services Division and the Senior and Long-Term Care Division. Acknowledging the difficult fiscal climate, the executive budget includes few new proposals, or proposals to fund new non-mandated programs (see Appendix A). Some notable investments are highlighted below. 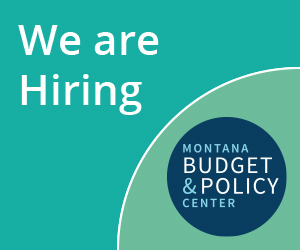 In 2015, the Montana legislature passed the bipartisan Health and Economic Livelihood Partnership (HELP) Act, to expand Medicaid eligibility to individuals at 138 percent of the federal poverty line (or about $16,750 for a single individual). To date, over 95,000 Montanans have accessed affordable health coverage through the HELP Act. The program is currently scheduled to sunset on June 30, 2019, unless the executive and legislature agree to continue the program. As part of his budget, the governor proposes to continue the HELP Act into the next biennium. Montana would continue to access the federal funds to pay for 90 percent of the costs of health benefits, well above standard federal Medicaid match rates. While continuing Medicaid expansion will happen through separate legislation, the executive’s budget projects that continuing Medicaid expansion will also result in $56 million in state savings over two years in the standard Medicaid program. These savings, along with $10.5 million in HELP Act premiums, help offset some of the $126 million in costs of the program in the biennium (thus, producing a net cost to the state of about $59 million over two years). This $59 million serves as the state match to access over $1 billion in federal funds. Conversely, if the legislature fails to continue Medicaid expansion, Montana would see $56 million increase in state costs for the standard Medicaid program. The executive budget proposes a 6.7 percent increase to K-12 education, including new funding for school districts to provide voluntary public preschool programs. The executive budget includes a present law adjustment of $81 million over two years for K-12 school districts. Additionally, the budget invests a total of $29 million over two years for preschool programs. Of this, $21 million is allocated through the Office of Public Instruction to individual K-12 school districts, while the remaining $8 million will be administered through DPHHS Stars to Quality preschool program (similar to the one-time-only (OTO) funds appropriated by the 2017 Legislature). The executive budget also proposes $5 million in new funding for need-based aid for Montana families enrolled in the university and community college systems. The budget reflects a $19 million present law adjustment over two years for the Montana University System and community colleges to maintain current programs. In response to the increased number of foster care and adoption placements, the budget adds an additional $35 million in general funds over two years for Child and Family Services Division (CFSD) within DPHHS, representing a 40 percent increase in its general fund budget. These funds will come with a corresponding $18 million in federal funds. The executive also proposes an additional 18 staff positions for CFSD. The budget funds those staff positions by transferring funding authority that was once used for the Montana Developmental Center (MDC). Policymakers will need to consider the level of services cut in the last biennium and how best to respond. In total, DPHHS faced a $95 million general fund cut in FY2017, factoring in actions taken during the regular 2017 session, triggered cuts under SB 261, and 2017 special session. These reductions included deep cuts to targeted case management for people with developmental disabilities, mental health needs, and substance use disorders, the closure of 19 rural public assistance offices, and reduction in services for seniors and people with disabilities access Medicaid services to stay in their homes. While $30 million of the total $95 million was restored to the agency’s 2019 base budget, many programs and services remain below 2017 levels. The executive budget proposes continued funding for bipartisan efforts by the 2017 legislature to improve the state’s criminal justice system. The Department of Corrections budget includes $400,000 over two years to support housing needs of those recently reentering from incarceration and $770,000 to continue work on pre-sentencing investigations, aimed at determining whether an offender may be best suited for drug court, treatment or other diversion programs that could reduce recidivism. Corrections continues to face increased prison populations that has resulted in increased costs in 2019. Policymakers should continue to take steps to enact budget-savings reform measures to reduce recidivism and the prison population. Legislative Branch Proposed 24% increase over 2019 base. Includes SWPL adjustments in personal services and operations. Approximately $3 million in new proposals include continued work on bill drafts, automated? session systems, legislator portal project, and digital vote boards. Governor’s Office Proposed 9% increase over 2019 base. Includes SWPL adjustments in personal services and operations. Department of Revenue Proposed 7% increase over 2019 base. Includes a reduction of $1.2 million to reflect cuts made in previous biennium (SB 261). Department of Administration Proposed 8% increase over 2019 base. Includes SWPL adjustments in personal services and operations. Department of Commerce Includes $4.5 million in new proposals, that includes continued funding for previously OTO funded Indian Country Economic Development grants ($1.75m) and Native language preservation ($1.5m), as well as, $1.2 million in general fund investment for Primary Business Sector Training program and $100k for upcoming Census. DOC is funded primarily outside of HB 2, through proprietary and statutory funding. Department of Labor and Industry Proposed 10% increase over 2019 base. Includes SWPL adjustments in personal services and operations. Department of Military Affairs Proposed 9% increase over 2019 base. Includes SWPL adjustments in personal services and operations. Executive also proposes to create a disaster recovery coordinator; GF investment will be matched by federal funds. Overall Department Proposed 8.5% increase over 2019 base in general funds, and a 2% increase in total funds. Includes SWPL adjustments in personal services and operations. DPHHS is funded primarily through federal funds, with about one-fourth of the total budget coming from state general funds. Provider Rate Increase Executive proposes provider rate increases of 0.91% in FY2020 and 1.83% in FY2021 for most providers of Medicaid services. Total cost of this provider rate increase is $12 million in general funds over two years. Medicaid Expansion Savings Medicaid expansion, if continued by the 2019 legislature, is expected to save the state $56 million over the biennium. The state would see a $56 million increase in general fund costs to standard Medicaid, if expansion is not continued. Healthy Montana Kids With a change in the federal match rate for CHIP, the state expects to see an increase cost for Healthy Montana Kids of about $35 million over two years (funded through state special revenue, with potential fund switch if proposed increase to tobacco tax passes). Human & Community Services Executive proposes $8 million to continue the preschool pilot program (through Stars to Quality program, with additional funds proposed to K-12 schools, see below). Montana will see $7.8 million in increased federal funds through the federal child care block grant program. Child & Family Services Present law adjustment of $34 million in general funds to address increased caseload for foster, adoption, and guardianship placements. New proposals include $1.5 million GF to add 18 FTE (transferred authority from Developmental Services Division from MDC). Quality Assurance Present law adjustment of 18 FTE to provide existing services for medical marijuana program ($3.8m in state special revenue). Developmental Services Proposed reduction to DSD in FY2020 (2% below 2019 base), with negative statewide present law adjustments (-$8.6m). Present law adjustments for Medicaid waiver caseload (increase) and Medicaid Core caseload (decrease). Senior Long-Term Care Proposed reduction to SLTC in FY2020 (7% below 2019 base) and FY2021 (2.7% below 2019 base). Includes negative present law adjustments of $9 million in GF for Medicaid waiver and core services. Increase $3.5 million in state special revenue to operate new SW Vets home. Addicted & Mental Disorders Total present law adjustment of $25 million GF to address increase caseload. Additional $3.1 million in GF to maintain existing services at MT State Hospital. Fish, Wildlife, & Parks FWP receives no general fund dollars and is funded primarily through state special revenue derived from hunting, fishing and access fees. Total fund increase of about 10% above 2019 base. New proposals total $5.3 million in state special revenue, including drought resiliency, enhancing water recreation, fisheries, equipment replacement, and wildlife monitoring. Environmental Quality DEQ funded primarily through state special revenue and federal funds, with less than 10% of its budget from general fund. Total fund increase of 4% over the 2019 base. Includes SWPLs for personal services and operations and $500k in SSR for orphan share expanded use over two years. Natural Resources and Conservation DNRC funded through state special revenue and with about 41% of its budget coming from the general fund. Total fund increase of about 4% over 2019 base. Present law adjustments include increases to maintain rural water tech assistance and drinking water loan forgiveness program. New Proposals include $400k for CSKT water compact, $700k to restore stream gage program, and $1.76m for Good Neighbor Authority project for national forests. Agriculture Funded primarily through federal and state special revenue, with total fund increase of 4% over 2019 base. Present law adjustments to maintain noxious weed program (SSR). Transportation DOT receives no general fund dollars. Federal revenue represents over 60% of total DOT budget. State special revenue is derived from vehicle fees and gas excise tax. Present law adjustments include restoring winter maintenance and increased federal funding for bus facilities. New proposal includes additional 6.0 FTE to create rural traffic management center to handle road reports/maintenance. Judicial Branch Proposes GF increase of 8% over 2019 base. Continue funding for court appointed special advocates program. New proposals of $1.7 million over two years, including funding for expiring grant for drug courts, child abuse diversion project, and pretrial program (OTO). Department of Justice Proposes GF increase of 8% over 2019 base. New proposals include $1.8m SSR for highway patrol salary survey; $1.4m SSR for additional 5 troopers to address increased traffic safety needs; $1m SSR for disaster recovery and Real ID efforts; $232m GF for forensic science division. Office of Public Defender Proposes 20% increase over 2019 biennium. This is primarily present law adjustment to address increased caseload ($10m). New proposals include attorney pay ladder adjustments and $1m to handle death penalty cases. Corrections Proposes 3.3% increase over 2019 biennium, mostly in present law adjustments. Corrections is reorganizing its youth services division into other divisions. New proposals include continuing investment in housing support and pre-sentencing investigations as passed by the 2017 legislature. K-12 Education Proposes 6.7% increase from 2019 base. Includes $81m present law adjustment for K-12, which includes BASE Aid, restoration of transportation payment, and restoration of data for achievement payments. New proposals include $21m to local districts to implement voluntary pre-k programs and $1.6m for MT Digital Academy ($1.6m). Higher Education Proposes 6.5% increase from 2019 base, primarily present law adjustment for university system ($17m) and community colleges ($1.1m). New proposals include $5 million for need-base aid for students within the university system and $700k investment for tribal colleges to provide coursework for students taking the HiSET high school equivalency test. Present law adjustment of -100m in reduced federal authority in guaranteed loan program. State Library Proposes 18% increase over 2019 base (though that still puts them 17% below 2017 base). Present law adjustment includes projected increase in coal severance tax allocation to library ($121k SSR); anticipated reduction in federal library and services tech funding. Historical Society Proposes 23% increase over 2019 base (thought that still puts them 7% below 2017 base). Makes permanent the $500k FTE reductions in SB 261, but increases PL adjustments. The second column notes the percent change from 2017 base budget to 2019 base budget. The agencies in red faced cuts in FY18 and FY19 and will start the 2021 biennium with a lower base budget. *The Office of the State Public Defender was funded as one-time-only in 2017 biennium (2015 session) and then funded on an on-going basis in the 2019 biennium (2017 session), so its base budget represents almost its entire budget. The second column notes the percent change from 2017 base budget to 2019 base budget. Nearly every division in DPHHS faced cuts in FY18 and FY19. Those in red will start the 2021 biennium with a lower base budget. Governor’s Office of Budget & Program Planning, “2021 Biennium Executive Budget,” November 15, 2018, http://budget.mt.gov/Budgets/2021_Budget. Legislative Fiscal Division, “Legislative Fiscal Report 2019 Biennium,” June 2017, https://leg.mt.gov/lfd/publications/. Governor’s Office of Budget & Program Planning, “2021 Biennium Executive Budget,” November 15, 2018, http://budget.mt.gov/Budgets/2021_Budget. Legislative Fiscal Division, “Medicaid Monitoring Report and Montana HELP Act Medicaid Expansion Report,” December 3, 2018, https://leg.mt.gov/content/Publications/fiscal/interim/Dec-2018/Medicaid%20monitoring_HELP_Dec_2018_V3.pdf. Legislative Fiscal Division, “Legislative Budget Analysis 2021 Biennium (Preliminary Edition),” accessed on December 3, 2018, https://leg.mt.gov/content/Publications/fiscal/interim/Dec-2018/Volume1-Preliminary.pdf. Legislative Fiscal Division, “Department of Public Health and Human Services: Funding by Authority,” accessed on December 4, 2018. Montana Budget & Policy Center, “Budget Cuts Devastate Health and Human Services,” February 2018, http://montanabudget.org/report/budget-cuts-devastate-health-and-human-services. For more information, see Montana Budget & Policy Center, “Yesterday’s Announcement of Cuts Restoration: Impact on DPHHS,” August 31, 2018, http://montanabudget.org/post/yesterdays-announcement-of-cuts-restoration-impact-on-dphhs. Montana 65th Legislature, “Senate Bill 60: Generally revise criminal justice laws,” 2017, https://leg.mt.gov. For the Department of Corrections, Senate Bill 9 restoration funds went “to mitigate potential supplemental appropriation requests for the department in FY 2019.” See Governor’s Office of Budget & Program Planning, “Senate Bill 9 Base Budget Restorations,” http://budget.mt.gov/Portals/29/docs/SB%209%20Appropriation%20Restoration.pdf.